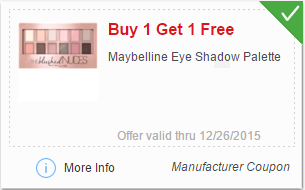 Savvy Spending: Meijer: Maybelline Eye Shadow Palette's for just $0.25 each after mperks coupon and catalina coupon! Meijer: Maybelline Eye Shadow Palette's for just $0.25 each after mperks coupon and catalina coupon! If you're headed to Meijer before December 26th, check out this deal! Buy 2 Maybelline Eye Shadow Palettes $10.49 each, Get a $10 Catalina Coupon when you spend $20 on select Maybelline and Garnier Products!